WÜSTHOF's GRAND PRIX II full-tang knives are precision-forged from a single piece of an exclusive high-carbon stainless steel. Completely buffed and polished by hand, the GRAND PRIX II knife blade is seamlessly attached to a pebble-textured, specially developed polypropylene handle that provides a secure and comfortable grip. 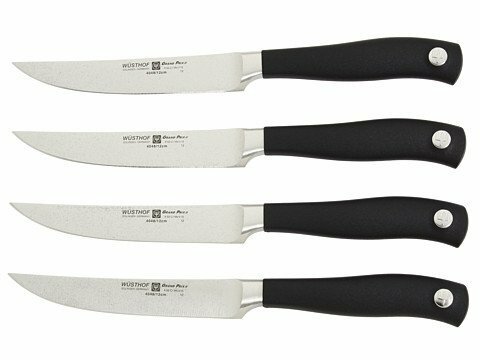 The Four Piece Steak Knife Set includes four 4 1/2" Steak Knives. Tang extends into the handle for exceptional durability.